País de estar e todos os bovinos em Doyle Creek Bunkhouse. Venha fazer nossos convidados! 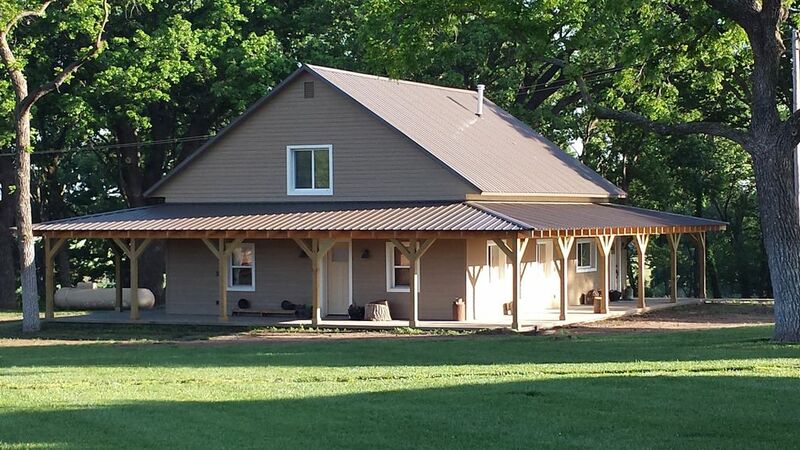 Aninhado nas Kansas Flint Hills em uma fazenda de gado de trabalho, Doyle Creek Bunkhouse é o refúgio de relaxamento e tranquilidade. Desfrute de um passeio nas estradas rurais, enquanto observa o pôr do sol e do pastoreio cervos nos campos. O Bunkhouse é grande o suficiente para acomodar tudo, desde retiros para reuniões familiares. A fogueira ao ar livre é o lugar perfeito para cozinhar ceia ou grade marshmallows. Um pequeno-almoço continental é fornecido. This is the second time we've stayed here when visiting family nearby. The Bunkhouse sleeps more than 10! It's a great place to stay (far nicer than any hotel), and it is particularly great in that it allows families to stay together. And you can't beat Sarah's cinnamon rolls! We thoroughly enjoyed our stay at Doyle Creek. The house was very comfortable and clean. Sarah’s friendliness and hospitality was second-to-none. She baked breakfast for us every morning...cinnamon roles, muffins, sticky buns. The house is in the country...quiet and relaxing...and right next to Cottonwood River which we took advantage of with a family swim. We’ll definitely be going back. Best place I’ve ever stayed! I had a total of 8 guys in the bunkhouse. We could not of been more comfortable! We was there for a fishing tournament and had plenty of room to park 4 trucks with boats hooked to them. Words cannot describe how we was treated during our stay. Sarah and Clint was the most amazing hosts I’ve ever witnessed. She was always bringing us some kind of tasty treats to eat. Think I will take my wife there for a weekend getaway soon! 5 STARS for sure! Thanks again Sarah and Clint! You have a beautiful place!!! We stayed with Sarah and Clint for our sons graduation from Tabor College. They are such friendly people and their place is so inviting. We enjoyed our stay and will definitely be back in the future. Thanks so much for being our guests! It was great to meet all of you! Hope to see you again soon!!! Enjoyed our stay. Warm beds, hot water, beautiful landscape. Delicious cinnamon rolls! My review is late...but here it goes :) I booked the bunk house for a girls weekend, after being reunited with friends at our 25th class reunion. It was perfect! We were able to cook, sit by the fire pit for drinks and all bunked in the loft for a slumber party! After we left they were starting renovations to add a bathroom upstairs which will make a great house perfect! If you are looking for a country getaway where you can relax and enjoy a quite weekend...this is it! Sarah & Clint are great host and you will feel right at home! We will be visiting again! Doyle Creek Ranch Bunkhouse está localizada a 1 hora de Wichita, a 45 minutos de Emporia e 30 minutos de Newton ou El Dorado. O Bunkhouse é de apenas 30 minutos do El Dorado State Park, a 20 minutos Marion Reservior e 15 minutos do Condado de Marion Lake. .